I am really not sure where the month of July went? Summer is nearly over and so many of the projects I just knew I would finish are still at the bottom of an ever growing pile. ugh. A new chicken scratch embroidery design for Halloween! It actually is embroidered with glow in the dark floss...gah, it is a-maze-ing! However, my camera pooped out during our vacay and I'm just not sure how I'm going to capture that after dark glow with an iPhone?? I hope to finalize writing the pattern this week because Halloween will be here before you know it! At a snail's pace, I am still trying to keep up with the Craftsy Block of the Month. This is June, recently completed in the month of July. *sigh* I love the block, the Lamoyne Star; but hated the technique of Y seams. This was actually my 2nd stab at completing it. The center points still are off but closer than the first try. And here is July's Tumbling Blocks all cut out. If I complete it today then I will have caught up...but alas, I seriously don't feel like sewing (more Y seams *sob*)...not to mention all the other things to do. I really do need to assemble it soon as just yesterday a sales rep came in threw a bunch of his stuff on top of all the teeny tiny pieces. What numb-nuts does that??? Seriously. Believe me, he was just as annoyed with me. 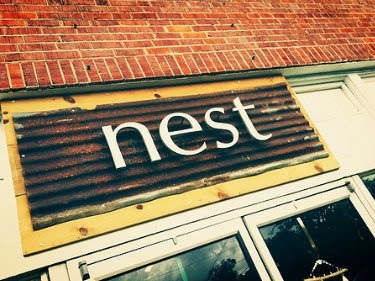 This is where modern day Southern collides with the "Grand Ole" South. Generally, I do not like sales reps to just drop in; I even have a nice note on the door to schedule an appointment. No one ever reads it; so when "grandpa" strolled in and asked if I was too busy to see a bunch of stuff in the trunk of his car. I replied "yes, I am - do you have a line sheet or website listed on your card" First I noted an air of disbelief that I was truly busy and then he seemed surprised that I would ask for something of this nature. A line sheet is a pretty common offering to leave with your clients. He was already teed off, but I was curious - "what other stores do you sell to in the area?" He wouldn't tell me, he just slyly prodded "who you worried about, honey?" No one - I just don't want to carry the same sh*t my neighbor sells. Anyway, hysterically - he told me twice before he left - that I could call him to set up an appointment. For what? I still have no idea what he sells?! Ahhhh, retail! It does keep life interesting! Ohhh, and before I forget! 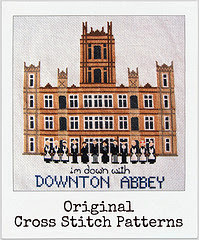 I'm so excited to say that just about a week or so ago, the HGTV Design blog featured my Downton Abbey Cross Stitch Pattern in a fun post about TV based DIY crafts. Yay! Check it out!